As Hapag-Lloyd Kreutzfahrten renamed itself Hapag-Lloyd Cruises last week, it celebrated the 125th Anniversary of its first cruise, which was offered on the 7,241-ton August Victoria in 1891. On the occasion of this event we look back at some of the world’s earliest cruise ships and cruise operations, which date back to the early 1880s. Meanwhile, Royal Caribbean Cruises and the World Wildlife Fund have announced a $5 million cooperation program to help ensure the long-term health of the world’s oceans. Last week marked a special anniversary for Hapag-Lloyd Cruises as it celebrated its 125th anniversary in cruising. In 1891, Albert Ballin, who would later become the line’s director general, launched the line’s first pleasure cruise on the 7,241-ton Augusta Victoria and in doing so laid the foundation of what is now a major industry. This first cruise was born of a purely pragmatic idea. The Augusta Victoria, flagship of the Hamburg America Line (HAPAG), spent its winters in lay up. Ballin proposed sending her on a Mediterranean cruise during the winter season instead. On January 22, 1891, the Augusta Victoria departed Cuxhaven with 174 guests from Germany, Britain and the USA and a crew of 245, on what proved to be a resoundingly successful two-month cruise. Not that Hapag-Lloyd was the first line to offer cruises, however. Ten years previous to this, one John L Clarke had bought P&O’s 2,021-ton Ceylon to cruise out of Southampton. This ship was said to be the first vessel to cruise around the world in 1883. 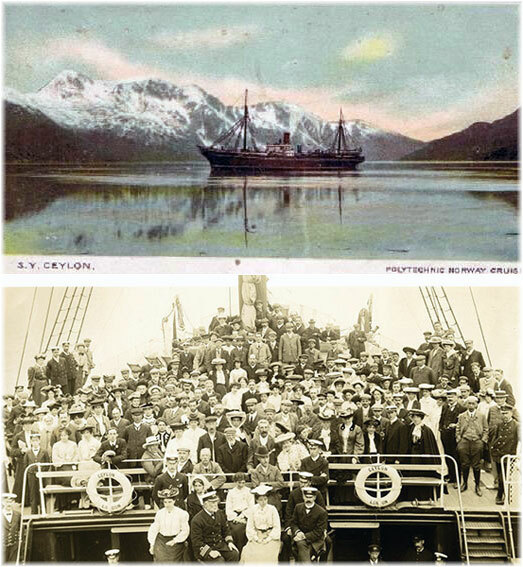 In 1892, the year after the Augusta Victoria’s first cruise, the Ceylon made her first cruises to Norway for the Polytechnic Touring Association (the Poly), associated with London’s Regent Street Polytechnic, now University of Westminster. In 1896, the Poly purchased the Ceylon and she continued cruising until she was broken up n 1907. Today’s successor of the Poly, which later became part of British travel company Lunn Poly, is Thomson Cruises. Ironically, both Hapag-Lloyd Cruises and Thomson Cruises now form part of the TUI Group. 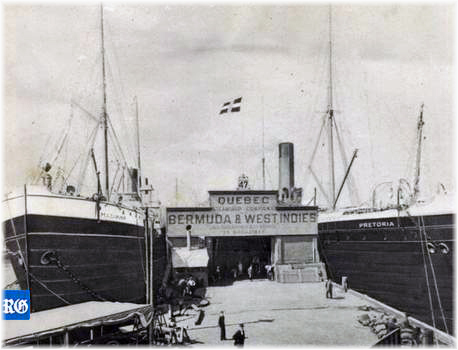 In 1894, meanwhile, on the other side of the Atlantic, the Quebec Steamship Co began operating “Special Cruises” from New York to the West Indies, which it offered every January and February. The usual itinerary included St Thomas, St Croix, St Kitts, Antigua, Guadeloupe, Dominica, Martinique, St Lucia, Barbados, St Vincent, Demerara and Jamaica. They were successful enough that in 1895 the company dedicated three ships, the 3,198-ton Madiana, 1,864-ton Orinoco and 1,817-ton Caribbée, to make one cruise each. The “French” chief stewards were of course from Quebec and not France. Back at Hapag, in 1899 the line operates its first cruises to the “Land of the Midnight Sun” and their success was such that the line then built the world’s first purpose-built cruise ship. The white-hulled 4,409-ton Prinzessin Victoria Luise made its maiden cruise from New York to the West Indies 115 years ago, on January 5, 1901, on a route that was pioneered by the Quebec Steamship Company and the Liverpool-based Atlas Line, which Hapag purchased in 1901. Unfortunately, the Prinzessin Victoria Luise was wrecked in Jamaica in 1905 after an earthquake had raised the sea bottom. She was replaced by the Union Line’s 7,859-ton Scot, which Hapag renamed Oceana and remained with the line until 1910, thereafter trading between New York and Bermuda and passing to the Quebec Steamship Company. Oceana was replaced in 1911 by the Victoria Luise, which was converted into a dedicated cruise ship from the Hapag Transatlantic liner Deutschland. In 1904, meanwhile, Hapag had commissioned another cruise ship, the 3,610-ton Meteor, which would remain with them until 1921, then to be sold to Norway’s Bergen Line. The Bergen Line subsequently built its own cruise ship, the 5,020-ton Stella Polaris, in 1927. A model of this ship can be found today in the Explorers Lounge of the Viking Line cruise ship Viking Star, which entered service last year. Stella Polaris was also known for making world cruises in the wintertime. The Stella Polaris vessel owed both her lines and her concept to the original Hapag cruise ship Meteor, and the Bergen Line, for whom she was built, was one of the original founders of the Royal Viking Line. The last Bergen Line cruise ship, now sailing as Fred. Olsen Cruise Line’s 804-berth Black Watch, entered service in 1972 as Royal Viking Star. 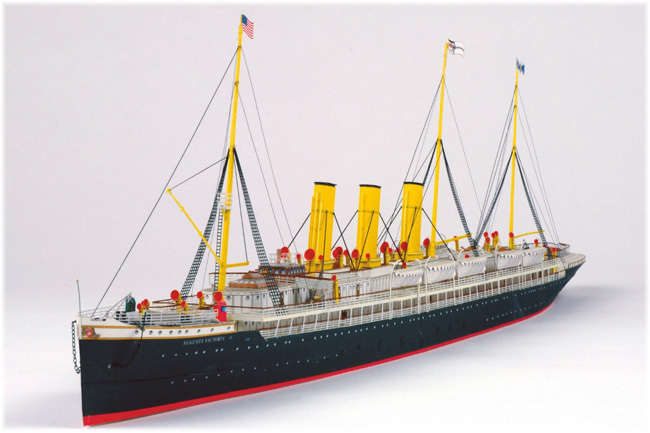 Two early cruising pioneers that also predated the Augusta Victoria were the Orient Line’s 3,847-ton Chimborazo and 3,876-ton Garonne, which were withdrawn from the line’s Australian service in 1889 to be sent cruising to the Norwegian Fjords and the Mediterranean. Nine cruises were included in the Orient Line’s sailing schedules in 1893. The Orient Line later became part of what is today’s P&O Cruises. To celebrate its anniversary, Hapag-Lloyd Kreuzfahrten, as it has been known in German, has officially changed its name to Hapag-Lloyd Cruises, at the same time adopting a new house flag that celebrates the introduction of its cruises in 1891. Hapag-Lloyd Cruises today operates the 516-berth Europa 2 and the 184-berth expedition ship Hanseatic in the English-speaking market and the 408-berth Europa and 164-berth expedition ship Bremen in the German-speaking market. Royal Caribbean Cruises Ltd, which includes the brands Royal Caribbean International, Celebrity Cruises, Azamara Club Cruises and Pullmantur Cruises, and the World Wildlife Fund have announced a five-year global partnership to help ensure the long-term health of the oceans. 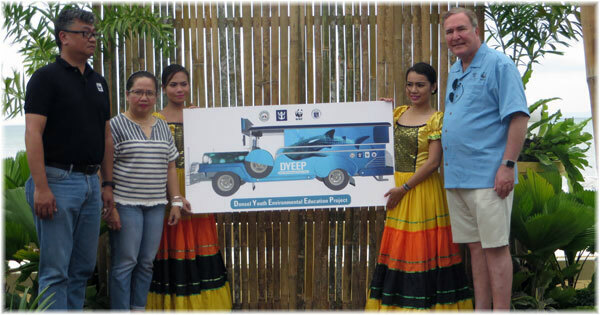 The partners will set measurable and achievable sustainability targets that will reduce Royal Caribbean’s environmental footprint, raise awareness about ocean conservation among the company’s five million plus guests and support World Wildlife Fund’s global oceans conservation work. The targets announced focus on sustainability and emissions reductions through 2020. Royal Caribbean and World Wildlife Fund are also working together to develop targets aimed at strengthening the company’s sustainable sourcing strategy and its destination stewardship and sustainable tour operations platforms. * Sustainable Seafood Target that will see Royal Caribbean responsibly source 90% of its wild-caught seafood by volume from certified sustainable fisheries, and in its North America and European operations, responsibly source 75% of its farmed seafood by volume from responsible farms. In addition, Royal Caribbean and World Wildlife Fund have agreed to develop and announce new targets by June 30 to address destination stewardship. World Wildlife Fund and Royal Caribbean will cooperate to strengthen the cruise line’s destination sustainability assessment and selection process. Royal Caribbean will also financially support World Wildlife Fund’s global ocean conservation work through a $5 million contribution during the partnership, and will cooperate with the World Wildlife Fund to build global awareness about ocean conservation issues among its millions of passengers. The five-year deal was announced in the remote Philippine village of Donsol, where the World Wildlife Fund supports the local tourist industry’s major attraction – swimming with whale sharks, the largest fish in the world. Royal Caribbean employs about 11,000 Filipinos on its ships worldwide, which at 14% of the workforce is the highest nationality employed on board its ships. Next story Will you be at the London Cruise Show?